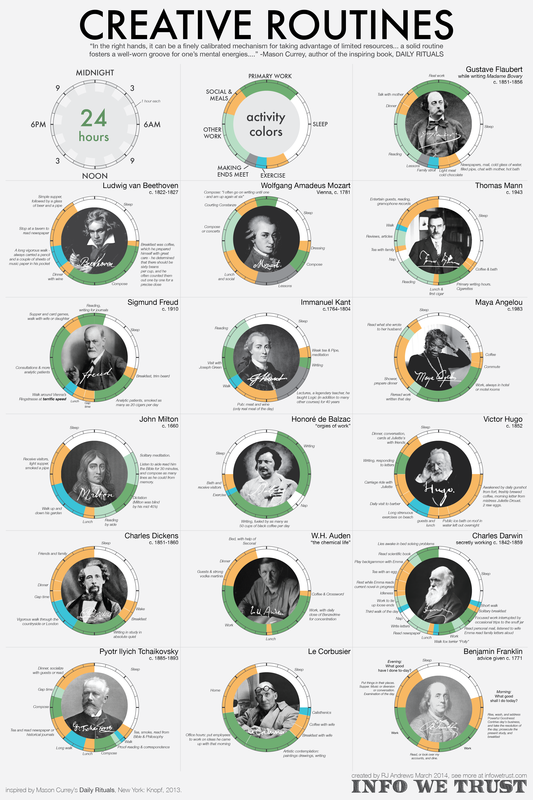 The folks at Info We Trust made an awesome infographic based on the book Daily Rituals to show the daily habits of a number of creative folks. It’s a really fun graphic, so you have to check it out. This is awesome! And timely to share given my recent post about morning routines. It’s great to see how different they are– it’s evidence of doing what works for you (as long as you’re doing something!). Check out this Info We Trust infographic! On weekdays, my routine is a Maya Angelou or Benjamin Franklin. On the weekends, I’m a Charles Darwin (especially because weekend naps are amazing). Who are you most alike? I’m turning on the comments for this post and hope to hear from you! I love comments! Unfortunately, my daily routine is not much like any of these. I guess if you define my “primary work” as childcare instead of as a creative endeavor like writing, my routine is most like W.H. Auden’s. I need my morning coffee and my glass of wine after the kid goes to bed. P.S. I really want to make your maple cookies now. P.P.S. Do foresters have Arbor Day parties? I think you should take those to an Arbor Day party…if Arbor Day parties exist. Thanks for your message. The Arbor Day party is a great idea. And good timing– it’s April 25th. I’ll definitely do a party and something webby too! Unfortunately, we can’t plant trees here (too much snow), but maple cookies might be the ticket! Hmm… I have to get planning!!!! Comments – cool! I think my schedule is more like Ben Franklin on weekdays, and maybe more like Charles Dickens on weekends (but with more sleep and less work). Next Next post: Nature is so neat!